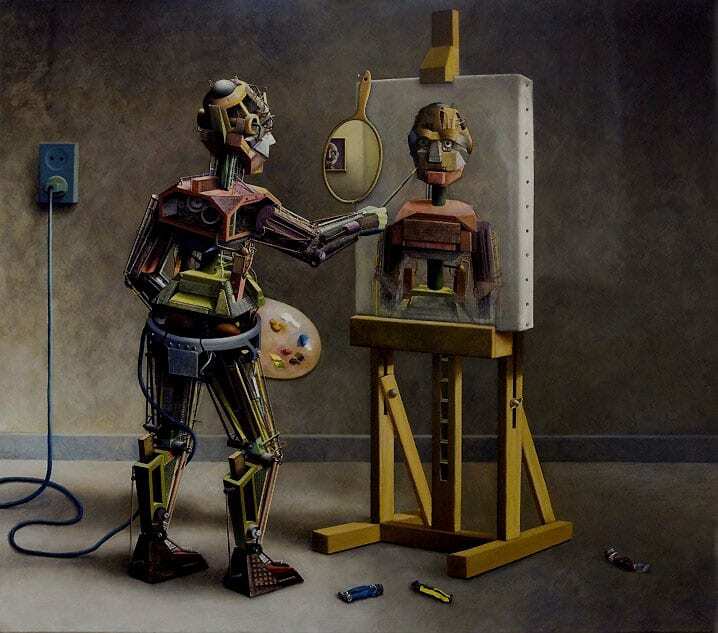 (Representational image) Artwork by Johan Scherft, titled ‘Robot, painting a self-portrait’. Most of us viewed technology as an accessory for humans to conduct their jobs better and making it a ladder to efficiency. With advanced artificial intelligence (AI) and machine learning, we would give up our mundane, repetitive tasks to focus on the creative side. But looks like AI is entering the realm of art too — something which was believed exclusive to humans and emotions. Will artists will be in the next line to lose their jobs to machines? Most millennials’ first memory of using tools to create anything resembling to “art” was 32-year-old now deprecated Microsoft tool, Paint. From using it as a doodler, to fixing image sizes, the programme, which generated feeds full of hue and cry over its so-called retirement, has been a worthy sidekick for many budding artists. It is still used by many illustrators as a nostalgic ode. Newer designing tools such as Adobe Illustrator, CorelDRAW, ArtRage 5 and Paper by FiftyThree, among others, have almost made using physical drawing or sketching tools redundant. As if the extreme sepia tones of Instagram filters were not enough, newer apps such as Prisma and its spawning websites are turning every photograph into a work of art. Created by Aram Airapetyan and co-founder and CEO Alexy Moiseenkov, the app got 85 million downloads within six months after it was released. Experts have pointed out that the app uses Convolutional Neural Network to learn the low-level style of an photograph, and applies it to the uploaded image and then processes images on the cloud server. Van Gogh’s bold strokes, Michelangelo’s sharp, intuitive carvings are no longer exclusive to the masters. With the correct programming and with the help of the right AI algorithms, several systems have learnt to automatically create art, not only in the domain of AI and computational creativity, but also in computer graphics and machine learning. For example, Google has made public its many AI experiments such as Quick Draw and Auto Draw tools that turn human doodles into artwork. Project Magenta from the Google Brain team advances the state of art through machine learning algorithms. Though it is still under progress, the aim is to make the programme the best machine learning platform for art and music, and connect artists with technology. In fact, so impressed are the artists themselves with the “learning” capability of these programmes, that artists like Mario Klingemann are using it to invoke startling results. Klingemann, for example, builds art-generating software by feeding photos, video, and line drawings into code, and then curates collections of hauntingly distorted abstract images — faces and figures, for his followers. Now, researchers from Rutgers University, College of Charleston, and Facebook’s AI Research Lab have created an algorithm that allows AI to create an artwork that human experts cannot distinguish the difference between works of man and machine. The researchers have made a Creative Adversarial Network (CAN) where the AI creates images that the discriminator recognises as art, but cannot categorise into an established style, thus creating a unique, non-human artwork. “If we teach the machine about art and art styles and force it to generate novel images that do not follow established styles, what would it generate? Would it generate something that is aesthetically appealing to humans? Would that be considered ‘art’,” asked lead author Dr Ahmed Elgammal of in a blog post.